You may think that Comet Arcade is a great, interactive application you can install onto your operating system. Unfortunately, it is usually identified as an unreliable advertisement-supported application. The reason for this is that the program allows third-party affiliates to present various pop-up and banner offers. Careless clicks on these offers may cause undesirable redirection to unreliable websites. Due to this, we suggest you remove Comet Arcade or at least take certain virtual security measures. 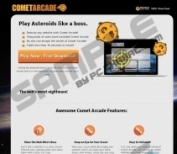 Comet Arcade is targeted at those computer users who like interactive online games and those who want to unleash their anger on certain websites. If you install the application and simultaneously press keys Ctrl+Alt+A, you will activate a shooter allowing you to hit the page you are visiting with the so-called asteroids. The concept is not new, and our researchers list Disasteroids and Websteroids as the clone programs. Note that these applications should be removed from the operating system as well. Even though the services of Comet Arcade may be quite enjoyable, what most computer users fail to realize is that the program allows the representation of online advertisements. 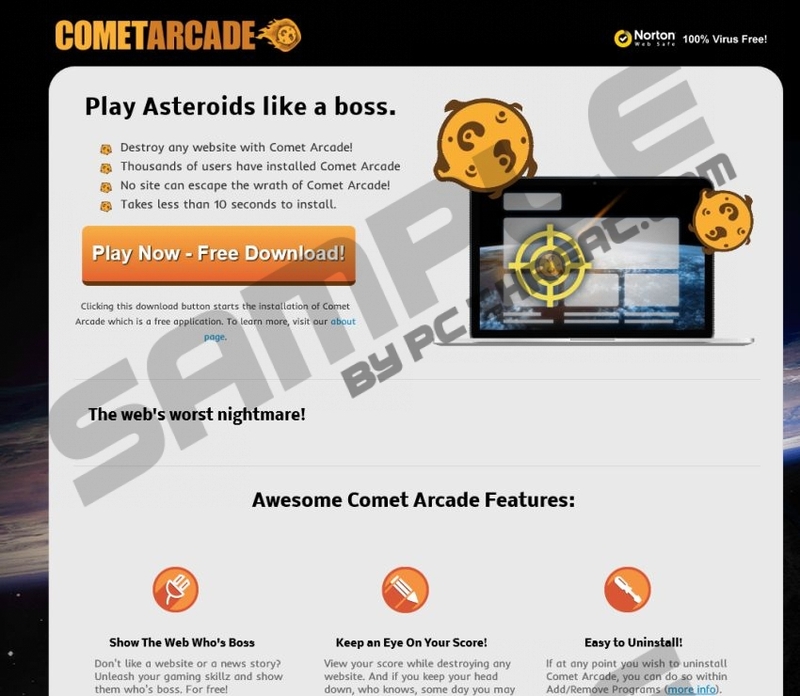 If you do not delete Comet Arcade, the application will connect to remote servers and allow the avalanche of different surveys, pop-up offers, banner ads, or interstitial suggestions. You also should remove the application to evade the suspicious in-text adverts represented through highlighted words. Note that you may face the removal of additional threats if you do not handle these ads appropriately. It has been revealed that Comet Arcade can enter the operating system packaged with third-party programs. Even though the installer on comet-arcade.com is active as well, many computer users install the application by accident when it is attached to more popular or desirable installers. If you know nothing about the application, you should delete it right away. If Comet Arcade removal is not something you want to rush into, we want to remind you that this is an advertisement-supported application which is affiliated to highly unpredictable third parties. If Comet Arcade removal is not what you choose, you have to get ready for the flooding advertisements. We recommend installing an authentic security application. This software will guard your virtual security, block access to unreliable sites and will warn you about various threats. This software will also recommend you to delete Comet Arcade from the operating system. This is the best solution when it comes to the removal of this application; however, you can also employ the manual removal strategy. Tap the Windows key to access the Metro UI menu and right-click the screen. Select All apps, then click Control Panel and finally go to Uninstall a program. Now right-click the application you wish to delete from the PC and click Uninstall. Navigate to the Task Bar at the bottom of the screen and click the Windows button. Select Control Panel to find more shortcuts to Windows utilities and click Uninstall a program. Right-click the application you want to delete from the PC and then select Uninstall. Open the Start menu by clicking the button on the Task Bar and select Control Panel. Double-click Add or Remove Programs and then select Change or Remove Programs. Remove Comet Arcade from the operating system. Quick & tested solution for Comet Arcade removal.